The other classic difference for these two is the liquor used. The Tom Collins should use Old Tom Gin, which is an old, slightly sweeter version of gin, while the Gin Fizz uses gin. I dare say that most Tom Collins’ made today don’t bother with the distinction. Strange that Axel has sour mix (which he states is 1/2 lemon juice, 1/2 sugar) along with yet more sugar. I guess that stays in line with the generally sweeter recipes in Lommebogen. Very much like the Gin Fix, this is a refreshing cocktail. 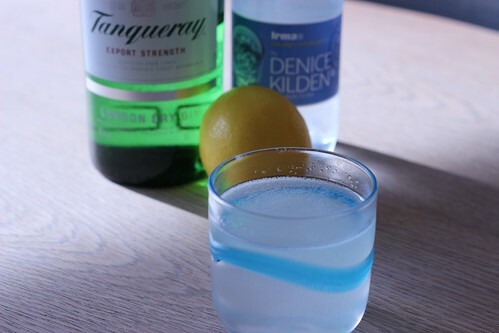 The soda water gives it a bit more play on the tongue, and you’ll want to play with the lemon/sugar ratio to get the tart/sweet balance you like.